I have six legs and two eyes: which are made up of many smaller eyes (or lenses). I have two stomachs: the first for my food, the second I use to feed other ants. I have two antennae that I use for smell and touch. 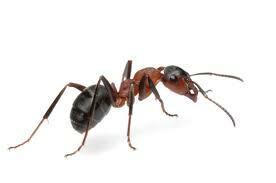 The queen ant has wings and so do the male ants, both for a short time. My jaws open sideways like scissors. I cannot eat 'whole' food, but instead use my jaws to squeeze out the juice and throw away the hull. I eat almost anything from other insects to vegetation. I live in a colony, which can be in an anthill in the ground, a rotted log, an infested structure such as the foundation of a home or tree. I have four stages of development: egg, larva, pupa and adult. The queen in my ant colony lays thousands of eggs. Worker ants take care of my egg until it hatches. I will live 45 to 60 days.